And we're back. 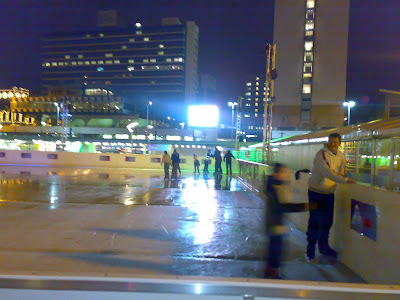 I went by the ice rink in Piccadilly yesterday afternoon, which wasn't so festive. A few people were skating (and falling) through puddles in the rain, but the big screen made it all look very Blade Runner. Some exciting news to report: Manchester freelance writer Maria Roberts, who (until now) has been anonymously writing Single Mother on the Verge, has just landed a deal with Penguin for a book based on her wry and funny semi-confessional blog. Maria has published several short stories and is a former City Life hack who has recently been working with Literature North West, and it's nice to see her hard work paying off. And you may note that Maria is the second of this year's crop of Manchester Blog Award winners to get a book deal. (Not that the award had anything to do with Chris Killen's, but still.) Maria credits the award with raising her blog's profile and boosting her own confidence in her writing, both of which helped her land the publishing deal. And I've heard something about a third blog award winner being commissioned to write a blog-inspired column in one of the nationals... sheesh. Do we know how to pick 'em? Santa's sack is bulging with new blogs for me to add to the blogroll, so stay tuned.